A B.O.A.C. Constellation flies over the pyramids of Giza. A remarkable print of this most charismatic piston airliner. A B.O.A.C. Constellation flies over the pyramids of Giza. A remarkable print of this most charismatic piston airliner. 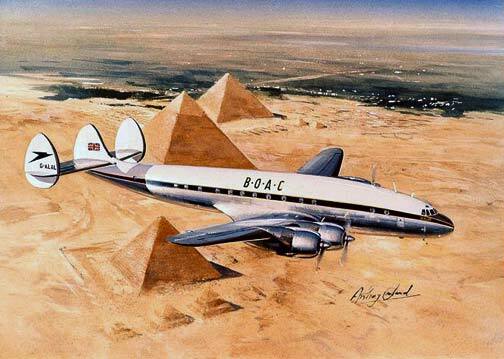 Along with the Stratocruiser this purpose built airliner must have seemed like a giant leap forward from the converted bombers used after the Second World War. A limited edition of 250, each signed and numbered by the artist Anthony Cowland G.Av.A.